If you copy Excel VBA code from a web site, for from any other source, you can paste it into your own workbooks. Most code should be pasted into a regular module, as shown in this Excel 2003 video tutorial. 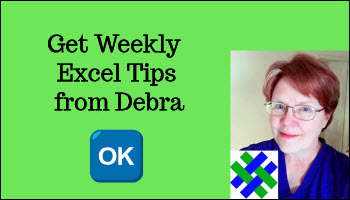 You can copy Excel VBA code from one Excel workbook to another, as shown in this Excel video tutorial. With an Excel Advanced Filter, you can filter the data in place, or to a different location. When applying the advanced filter, you can specify that you want to see unique items only. With that option selected, all the duplicates are removed from the filtered list. With an Excel Advanced Filter, you can filter the data in place, or you can filter it to a different location. In this Excel video tutorial, you'll see the steps for setting up the advanced filter so the results are moved to a different worksheet, and the key steps for making this technique work.